It’s difficult for me to take and post photos of the house looking bad because I like it so well. I gravitate towards images that make it look more or less how I want it to look at the end. 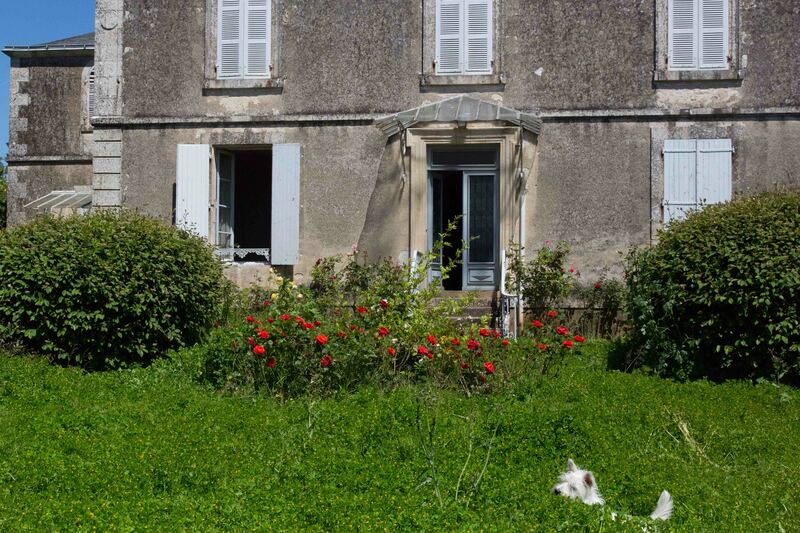 But here you can see how big the weeds have gotten; yes, Jacques is standing in that photo. You can also see how degraded the exterior surface of the house is. In time the contractor will power-wash the walls and put something called rendering, a sort of hard plaster finish, over the gray area. 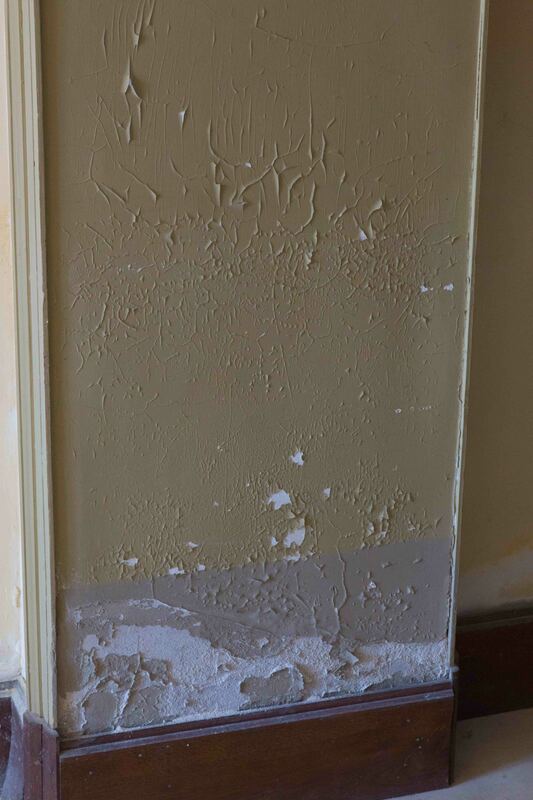 The upper photo shows rising damp in the entry hall. The house was protected from rising damp until the heat was turned off when the house was listed for sale, two or three years ago. Once the heated floors are installed, the foundation will dry out and this will no longer be an issue. Look at all that wild clover! You need a cow. Absolutely! I have about an acre that looks just like that! Seriously, Brent, I have been reading that hair sheep are the way to go, maybe three, so they don’t get lonely. Good temperament, no shearing, easy care. My kind of lawnmower. They are fairly well known in the States but I haven’t found any here in France. If you come across some, let me know. Seems a fine idea. Some neighbors have a few to clean their yard. I don’t know what the French word for hair sheep is. Maybe there are some in leboncoin. Sheep or hair sheep? Wooly sheep are everywhere. Hair sheep — moutons de chevaux? Brebis de chevaux? — are so far not to be found. Well, unless I want to go to Canada. All the ads in French pointed me to some far-off corner of Quebec. I’ll keep looking. No rush. That grass will be out there for a long time to come.